Doug and I have "known" each other via the internet for over twenty years. He, Joe Huber, and I were the three that started emailing each other to form the Desert Island Gamers (DIGers) mailing list that was a main source of boardgaming information before sites like BGG were around. Heck, we go back far enough that we knew each other from IRC chat sessions. Although the distance between California (me) and Australia (Doug) has prevented us from meeting in-person, we've kept up an irregular correspondence for all of those years. Doug was on my wargames podcast a couple years ago, and at that time I knew I had to get him on Boardgames To Go, too. He maintains his wargaming days are mostly behind him, and he's almost exclusively a eurogamer now. When he dove into his own private, Knizia boardgaming marathon challenge, I knew straight away that this was the topic we'd discuss. Being gamers from way back, I knew he'd be exploring lots of classic Knizia titles from the 1990s. He didn't stop there, though. 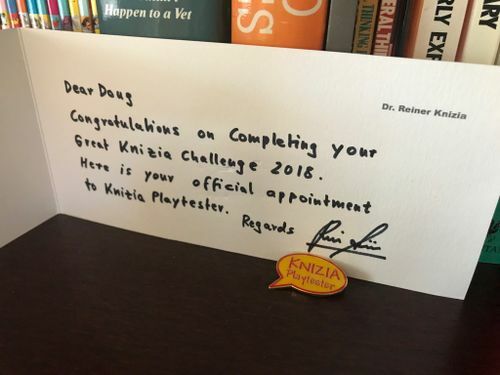 He played every kind of Knizia game he could, from those early titles that impressed so many of us, through some recent years when Knizia was less visible, all the way up to the present day's "Reinerssance." Though this challenge was big enough to begin with, Doug kept adding to it as the year went on. Then he managed to actually complete this gargantuan challenge by the end of September. Amazing! I invited him on the podcast to talk about that entire experience, both the Knizia games he enjoyed, and the very nature of personal boardgaming challenges. With the new year coming soon, I bet some other gamers will be inspired to try their own challenges. More power to you. Be sure to also check out Doug's excellent blog here on BGG, full of great photos and tidbits about the games he plays. It's called Reducing Doug's To Play List, which gives some sense of its general purpose. 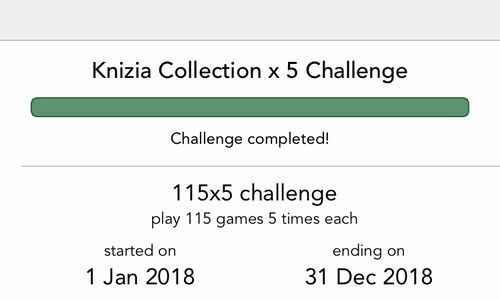 He posted monthly recaps of his progress through his "Great Knizia Challenge."